Bryological recording on Serra de Monchique, a mountain range situated in the Mediterranean biogeographic zone close to the Atlantic Ocean, dates back to the mid-19th century. However, bryological recording has been sporadic, and compared to other localities in Portugal, it has been neglected in recent decades. My own study began in the mid-2000s, with more frequent visits in the last 5 years. Preliminary results indicate that within the Serra de Monchique range that there are about 300 species (223 mosses, 75 liverworts and 2 hornworts), of which about 12% are considered threatened in Portugal, with many more Data Deficient. Bryoerythrophyllum campylocarpum and Marsupella profunda are listed on Annex II of the Habitats Directive, 5 species are new to continental Portugal (Bryoerythrophyllum inaequalifolium, Dicranum canariense, Diplophyllum obtusifolium, Fissidens monguillonii and Rhynchostegium confusum), 42 species new to the Algarve and one species described new to science (Coscinodon monchiquensis). A high proportion of the species belong to the Mediterranean-Atlantic element, but other important phytogeographical elements include EuropeanTemperate and Circumpolar Boreo-temperate, with the Boreo-Montane elements indicating a link to the more mountainous regions further north in Portugal. A special Tertiary relict wetland habitat is Rhododendron ravines, characterised by Fissidens serrulatus and Rhamphidium purpuratum. Amongst the other habitat types, Rocky Inland and Artificial (after IUCN) are also of particularly high interest. There are several threats to the bryoflora, the most significant being commercial Eucalyptus forestry and fire. A photographic monitoring scheme was established to follow post-fire recovery of selected saxicolous mosses on Fóia. 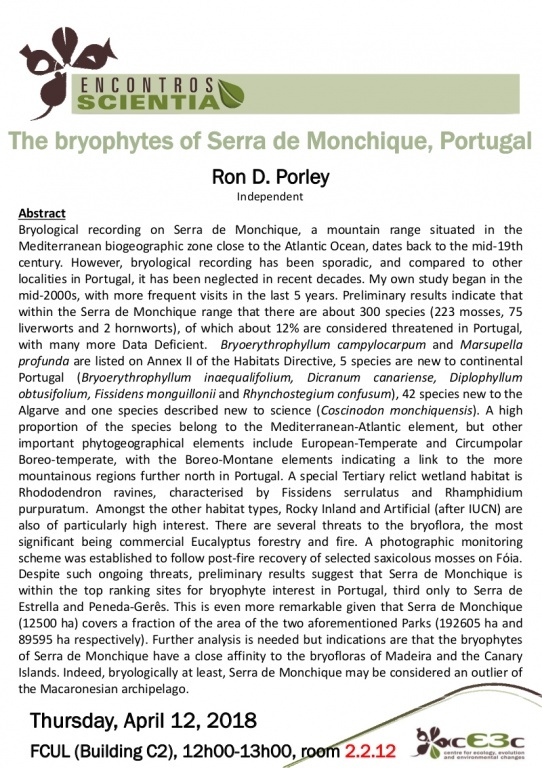 Despite such ongoing threats, preliminary results suggest that Serra de Monchique is within the top ranking sites for bryophyte interest in Portugal, third only to Serra de Estrella and Peneda-Gerês. This is even more remarkable given that Serra de Monchique (12500 ha) covers a fraction of the area of the two aforementioned Parks (192605 ha and 89595 ha respectively). Further analysis is needed but indications are that the bryophytes of Serra de Monchique have a close affinity to the bryofloras of Madeira and the Canary Islands. Indeed, bryologically at least, Serra de Monchique may be considered an outlier of the Macaronesian archipelago. I was a botanist in the governmental statutory nature conservation organisation in Britain, initially as a field surveyor of higher plants, but finished my career as chief adviser on bryophytes. I have been on several expeditions to collect bryophytes in Africa (mostly Uganda and Malawi) and was involved with the work on the Iceman, a mummy discovered in 1991 entombed in ice on the Italian-Austrian border. I have bryologized in many other countries of the world including Nepal, Dominica, Réunion and several European countries. I took early retirement in 2009, came to live in Portugal, and since then Serra de Monchique has been my project. I specialize in Grimmia, a group for which I am referee for the British Bryological Society. I have written many papers and some bryological books, the latest published in 2013 on England’s Rare Mosses and Liverworts.